For my daughter’s 13th birthday, she requested a red velvet cake to fit in with her “Twilight” vampire theme. I decided it would be a perfect opportunity to make a vegan cake! 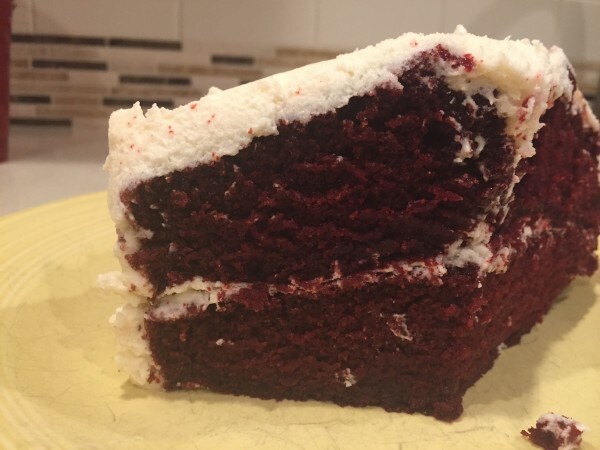 I randomly found a recipe on the internet while googling “vegan red velvet cake” and made it without really over-thinking the ingredients or looking at comments. First of all, it turned out delicious. Everyone loved it and you would probably not know it was vegan based on taste. However, that said, I would adjust the recipe in the future. It was really quite decadent. 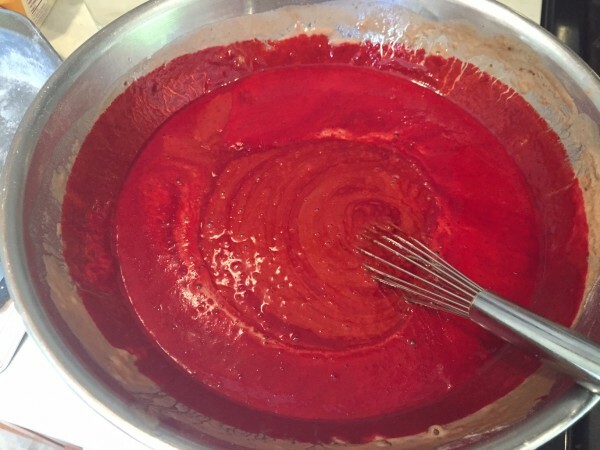 The batter called for a full 1/4 cup of red food color. I went with just 2 oz (still a full small bottle), and it was still very red. I probably could have also cut back on oil, vanilla and sugar too. For the frosting, I ended up with double what I needed because I didn’t do the piped rose decorations. The recipe called for 2 sticks of vegan shortening and 2 sticks vegan butter, and a full 32 oz bag of powdered sugar, but half that would have been fine since I just frosted, but didn’t otherwise embellish the cake. This cake was very moist and delicious. I wish I would have frosted between the two layers more, as that would looked nicer. I needed to refrigerate the frosting for quite awhile since it was very soft. Definitely don’t frost it while it is too soft! So, I would make this again with adjustments! 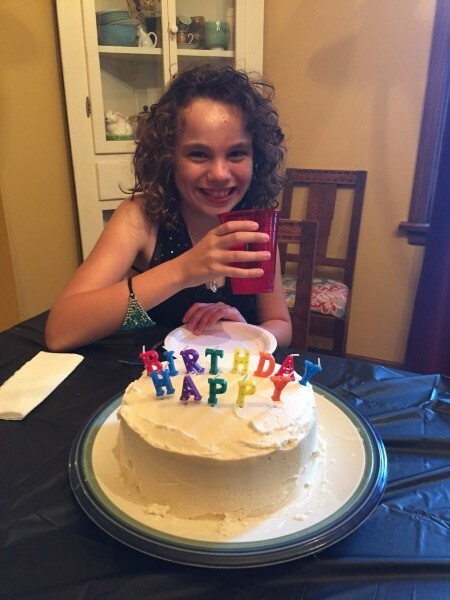 It was a big hit with the teen girls and everyone asked for more than 2 pieces each! Sorry my photos don’t really do it justice. Check out the recipe below to see how pretty it looks with the roses! This is from one of my favorite Indian resources, holy cow vegan. I made it so quickly, and it is really delicious. Pretty healthy too- just 1 T oil to sauté the onion, and used 1/2 cup light coconut milk. I used a full 16 oz of mushrooms, and 4 loose cups of spinach, and curry powder instead of sanbar. Just add brown rice and it is a quick, tasty meal. It is staying in my repertoire. Not as much a favorite for kids I would guess, will have to let you know on that. The fact that one of my kids doesn’t like mushrooms or onions doesn’t bode well since neither are disguised at all. Look at her photos on the website to see how it should look. It is almost impossible to mess up I think! I’m excited to start cooking my Meal Mentor plans starting tomorrow! I bought all the ingredients for around $100 for what will hopefully be a full week’s worth of food. I did add a few things we just needed like bread, coffee and cereal. Some of the ingredients were very expensive like a bottle of maple syrup, but will be used for awhile. The 4 portobello mushrooms, artichoke hearts and 6 red peppers were a bit pricier items than I would normally purchase. I’m running out of ideas and need some help with what to make. This was nice to not even think about it, just buy what was on the list. Meal planning really has made my life easier since I am not running to the store every day… I think we will save money in the end and with this meal plan, it uses only whole foods, no fake meats or processed items. The most worrying part is whether the kids will eat it some of these recipes that are a bit unusual like “lobster rolls” using artichoke hearts. Here is the menu, take a look! I’m posting, just to keep up with my record of posting every day for veganmofo… but we ended up having leftover tacos (kids requested it) and soup. I could have made a stir fry, but sometimes you just go with the flow. Last night I signed up for Happy Herbivore meal planning, but have not been able to start that immediately. Tonight I went to an event listening to Peter Singer speak in a town an hour away which I will post about tomorrow! I did end up eating some delicious vegan food at the reception sponsored by NW Veg. My favorite is a local company Missionary Chocolates… yum. The first time I had this soup was when I lived in Bellingham, WA while I was attending WWU. Tony’s coffee shop served it, and it was amazing. Now, 20 some years later and Tony’s Coffee is a big deal with it’s own coffee brand that you can buy through Kroger’s. Maybe my nostalgia made me want that soup again, but also just these naturally vegan ethnic foods are my favorite meals: Indian, Middle Eastern and Ethiopian for example. I found this recipe and followed it pretty closely except I left out the spicy chile pepper (for the kids), and I blended it with my immersion blender except for about a cup of it which I stirred back in. I also grated a little ginger into it since that is how I remember it. This recipe was pretty easy! Found it on Oh My Veggies, which looks like a great resource, will definitely check out the other recipes on the site. Have I really only been doing this 8 days? It is not that vegan cooking every night is hard, it’s that making something consistently blog-worthy, like a real recipe is hard. Last night we had kids over after school, swim practice, and I was very tired from staying up too late the night before. The kids wanted tacos, so it worked out perfectly. I had some shells I heated up in the oven, re-fried beans, lettuce, tomato, salsa and avocado. I also made a delicious taco meat out of ground up walnuts with just a few spices and soy sauce. Well, the kids wouldn’t try it- but trust me it is really good! You can serve it on the side. (-; I may try again with a tempeh version in the future. And Taco Tuesdays are the best- I think we will keep those in rotation since those are crazy days. It would have been a perfect day to make a veggie burger for our neighborhood block party, but instead I made a lentil dal from Forks over Knives AND salad rolls. Forks over Knives was one of the critical turning points in changing how I ate. There were two reasons: one was my daughter, and one was this film. After watching the film over three years ago, I decided to try a month eating vegan. Pretty powerful. And the strange thing is, the health reasons that started me down this path are not what keeps me on the path at all. I’m strongly motivated not to eat meat mostly because of how it affects our planet and all who exist on it. Then knowing the suffering of the animals keeps me from being overwhelmed by the enormity of trying to affect climate change. Finally, I hope that our family will be healthier in the end for it. I do take iron and B12, and pay attention to balancing our diet, taking time to incorporate a wide variety of vegetables. A very small effort to make. I made the lentil dal because it sounded good to me. And it tastes good to my husband and I, but honestly, the kids aren’t a big fan of it. So, I thought I would attempt to make Vietnamese salad rolls. We have a store nearby, Bui’s Natural Tofu, that makes the best rolls and tofu. The kind I buy all the time to take to potlucks. Their lemongrass tofu is amazing, as well as the green onion tofu. Making salad rolls was a bit more difficult than I thought because I had to bake some tofu, which required a marinade, and the peanut sauce for dipping (that part was pretty easy). I julienned some vegetables, and cooked some rice noodles. But, when I tried to assemble them, they just didn’t come together that well. I think I needed larger wraps for one thing. It wasn’t a total fail, and I want to try it again, but just not with that recipe. If anyone has a good recipe for Asian salad rolls, please let me know! We lucky Oregonians are fortunate enough to have Café Yumm as a local, regional restaurant chain. The menu’s main feature are bowls that start with rice and bean base, but are customizable. Their signature Yumm sauce is what puts the “yumm” into the name. We support them whenever we are traveling in one of their many locations, or happen to be getting lunch out in downtown Portland. However, we also started making this a party dish at home with friends and family. It started as a way to make something that our family members who are not vegetarian would enjoy since the customizing part is quite fun. It also is easy to make. Steam a bunch or rice (we prefer brown), place this on the table with smaller bowls of individual bowls of toppings: chopped avocado and tomato, sliced black olives, beans, vegetables (steamed broccoli). You can optionally have faux meat, tempeh or tofu on the side. We made this for my daughter’s birthday, and in addition to the delicious yumm sauce, I tried making little blocks of tempeh. They turned out really well! A bit more work, but very delicious. My kids LOVE tempeh, in fact even my dad liked tempeh. When prepared well, it has a bacon-like texture and savory umami flavor. I ended up cutting the blocks of tempeh into 1/2 inch pieces and ended up with at least 32 pieces since I wanted as many as possible and marination to be better. The only other thing the recipe doesn’t mention, but is important, is to steam the tempeh first. I just stuck it in the steamer basket of the rice cooker for awhile (maybe 10 minutes). It allows the marinade to be better absorbed. My mom made the Yumm sauce in advance, it works great in a vitamix. You can use it as a topping on other options like quinoa, or even a sandwich spread. In a blender or food processor blend almonds, tofu, chickpeas and oil. I used just the tempeh portion of the recipe from here. Another favorite from Engine 2, I have made this a couple times before and even my picky kid really loves it. It is a healthy meatloaf, that if you do it right, makes a most delicious sandwich. It has great texture and flavor. So, the recipe online has one major difference from the one in my book. They revised it to be more plant-based by using lentils instead of the fake ground beef meat the book version uses. Well, I made it the book way, but I am sure it is just as delicious with lentils. Especially if you cook those lentils in vegetable broth. Besides using that package of “meat” crumbles and I recommend Smart Ground Original from Lightlife, I also left out the onion powder, sage, thyme and all spices simply because I didn’t have them on hand. It was still really good, but I think that would have made it way better. If you want to make sure it doesn’t fall apart, mash up the tofu and make sure it has enough liquid. We had it with some potato salad that a friend brought us, and it was delicious! One of the easiest, fastest kid meals to make is homemade mac n’ cheese. I have it down to a one pot process, adding in frozen vegetables with the noodles at the end, and everyone is happy. I’ve made it using vegan butter and soy milk, but still using some cheddar cheese. This is one of those dishes on all the vegan menus that everyone tries to recreate. This version got rave reviews, and gave me a way to incorporate the butternut squash we had on hand. I followed the recipe closely except I didn’t have onion and garlic powder, and used soy milk instead of almond milk. The cheese sauce was delicious, and I think I could eat that part all alone. The butternut squash was delicious, and everything would have been great except I over-cooked the macaroni noodles a bit. It still worked, but just got a little congealed. Results: the adults and one kid loved it. The picky eater would not try it. Maybe it was the smell of nutritional yeast that alerted her, but she knew there were secret ingredients in that sauce and she refused to try it. Despite the fact that her favorite thing to order at one of her preferred restaurants, Paradox Café, is their fake bacon garlic Mac n Cheese. Although that item did apparently win a Vegan Iron Chef competition, all I can say is holy garlic! I think this one is a keeper despite being much harder than my usual method, it was also healthier and tastier. Here is the recipe from Oh she glows, a great place to find vegan recipes. We always order a stir fried rice when we get Thai food. Traditionally, it uses fish sauce, and egg. I’ve played around in the past with making my own version, but decided to use a recipe this time. I’m not going to lie- it took me a lot longer. The tofu was the best part, baked and then marinated, and then stir fried. Surprisingly, there were no fats or oils used in this recipe. You may be wondering why I don’t post photos with these. Well, reason number one is that I am not great at photographing food. Reason number 2 is that my food does not always look that great. I’ll work on this, but until then, click on the link below and you can see the very appealing photos with the recipe. Shortcut used on this recipe: Frozen mixed vegetables instead of fresh. Family’s impressions: Overall, they really liked it. My daughter was quite pleased there were no onions. I think I might try it again, this time without burning some of the tofu in the pan. I got this recipe from Minimalist Baker, who promises “simple, delicious recipes that require 10 ingredients or less, one bowl, or 30 minutes or less to prepare”. Somehow this took me an hour, two pots, a bowl and a cookie sheet. I do love her concept, photos and recipes, so I will try to step things up on my end.